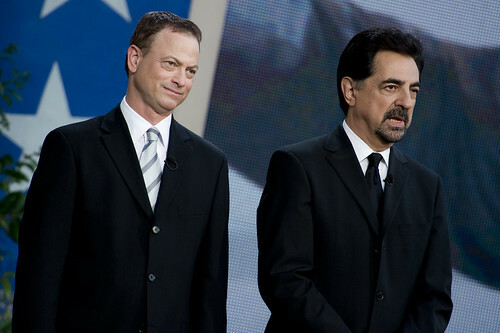 Gary Sinise Above (left) Was One Of The More Famous Faces In The Mitt Romney Beverly Hills Fundraiser Saturday night (22 September 2012). 22 September 2012, Beverly Hilton Hotel was the site of a Mitt Romney Hollywood fundraiser that raised $6 Million. 1,500 people paid $1,000, $15,000, or $50,0000 to see the candidate speak. Comedian Dennis Miller and musician and record producer David Foster also spoke. Among the most famous attendees were megaproducer Jerry Bruckheimer, CSI: NY’s Gary Sinise, and Everyone Loves Raymond’s Patricia Heaton. Also in attendance were Terry Semel (former Warner Brothers chair), Burt Sugarman (Children of a Lesser God producer), Frank Price (former head of both Columbia Pictures and Universal Pictures), Lionel Chetwynd (DC 9/11: A Time of Crisis writer/producer), John O’Hurley (General Hospital actor). Outside the hotel, a group of Obama supporters called a news conference to point out Mitt Romney’s tax returns, corporate record and other issues. Pending as to whether the group of Obama supporters also called attention to the dismal economic record under President Obama or drew attention to Taxmageddon, the largest tax increase in America’s history, that is coming to every middle class and low income worker January 2013.